The unique material properties of Sorbothane® make it an ideal choice for a wide variety of sporting goods and fitness products. 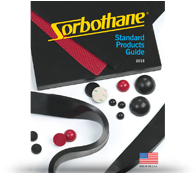 For over three decades, Sorbothane® Comfort & Performance Insoles have provided cushioning comfort and protected active users from damaging foot strike shock. Sorbothane® KICK-EEZ® pads absorb and isolate recoil from rifles and shotguns. We worked with a young ice skater to develop a special protective Sorbothane® pad to offer cushion from falls. The sting of a baseball has been tamed by Sorbothane® without any rebound. See samples of solutions we’ve provided to the Sporting Goods & Fitness industry.